LilyTiny is a quick and easy way to add twinkling lights to a project without any programming or a bulky Main Board. It’s also a great educational tool for showing a range of functionality without having to get out the computers. 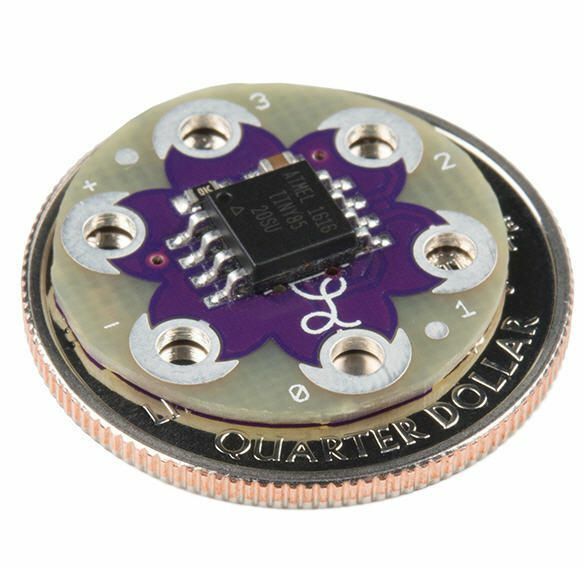 The LilyTiny is a tiny little LilyPad board designed to add flashy functionality to your project without taking up a lot of room. Even though it is as small as some of the LilyPad sensors, this board actually has an AT tiny microcontroller on it so it is actually pretty smart! Simply sew on four LEDs and connect a battery and the LEDs will each blink or fade differently. One will blink on and off (2), another will flash a heartbeat pattern (1), another will do a 'breathing' fade (0) and the other will do a random fade (3).